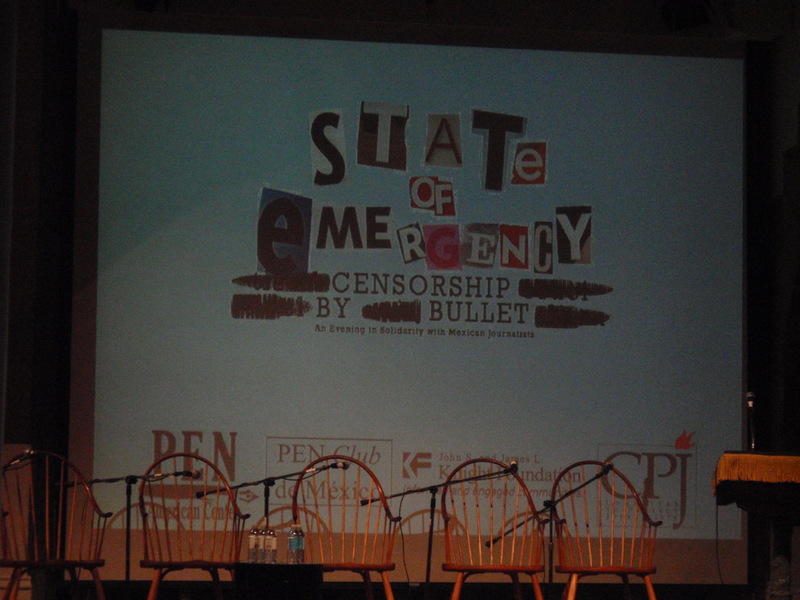 Last night, I covered the PEN organisation‘s “Evening in Solidarity with Mexican Journalists” for Electric Literature’s Blog. The evening was held at The Great Hall at Cooper Union, and writers like Don DeLillo, Paul Auster and Laura Esquivel were present. It was a sombre occasion, a great deal of urgency underlying every aspect of the event. There was a large Latin American and Spanish presence in the big crowd, as you would expect, and I bumped into a gang from NYU’s MFA in Creative Writing in Spanish. As one of them said, “we’re primos hermanos (first cousins), but there isn’t much linking up between the two groups, we need to get together more.” Before the event, I knew almost nothing more than rumour about what Mexican journalists, and the population at large, are facing. Click on the Electric Literature link at the top of this post, read up on it, and if you have a bit of time, look into what the Committee to Protect Journalists, and PEN, have to say about what is happening in places like Juarez, to journalists and the general population. It’s awful, but awareness, at the very least, needs to be spread.